When Nintendo announced the launch of the Switch by using footage from The Elder Scrolls V: Skyrim, it was a surprise -- but a reasonable one. Bethesda's open-world adventure game was beloved, but old enough that a port to Nintendo's new console seemed entirely reasonable. When the company announced that it was bringing the upcoming Wolfenstein II: The New Colossus and last year's Doom reboot to the Nintendo Switch, however, it gave us pause. Those games were made for more powerful platforms, like the PlayStation 4 and Xbox One. It sounded ambitious, but if the early build I played of Doom is anything to go by, they might actually pull this off. To start, Doom on the Nintendo Switch feels identical to Doom on other platforms. The same fast-paced, demonic shooter action that embodied the spirit of the classic game is there, and it still feels great. Sprinting through corridors of the UAC facility or performing stylistic "execution" glory kills on the spawn of hell is as satisfying as ever. The controls feel right. The complete experience translates. 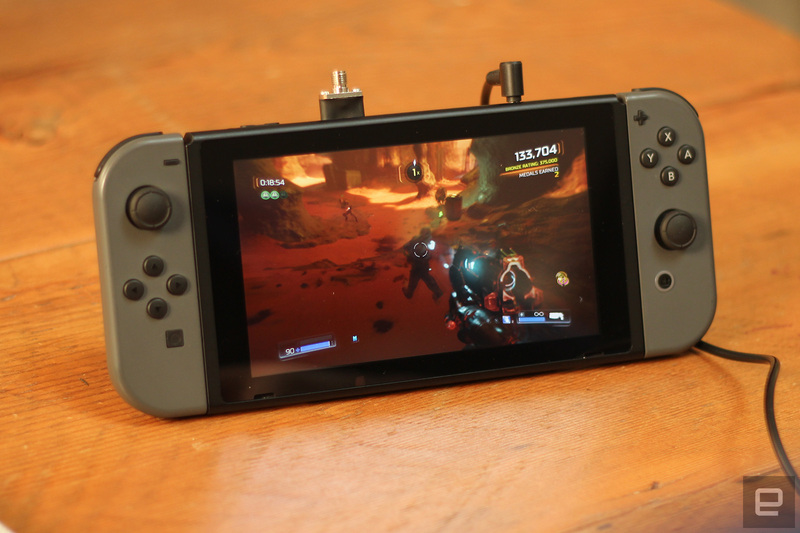 Still, the question that hung in everyone's mind during the game's announcement is the same one that lingered as I played through Bethesda's portable Doom demo: Can the Nintendo Switch really handle this game? At first blush, the answer seems to be yes. But the details of that answer were harder to make out. Bethesda only let us try the game in Switch's handheld and tabletop modes, limiting our view of the port to the console's 6.2-inch 720p display. Scaled down to that screen, the game looked pretty sharp -- but behind the glare of the glossy display, it was hard to see what compromises might have been made. I spent half of my demo time staring at rocks on the surface of mars, trying to determine how that texture might look if it were scaled up on my 40-inch TV at home. To the game's credit, it looked good during the limited demo. I played through the first level of Doom without noticing any hiccups or slowdowns. At worst, the game seemed to have notably long load times and a little bit less anti-aliasing than its full-console counterparts -- but without the advantage of seeing the Switch docked in console mode, it was hard to say for sure. Either way, it was a pretty early demo of the game. The full game is playable, but when I noticed a dip in framerate during some of arcade-mode's later levels, staff on hand told me that most of the game hasn't been optimized for Switch just yet. Doom on Nintendo Switch is promising. It shows that with enough work from a dedicated developer, current-gen games can make their way to the hybrid portable. It's also a strong show of support for the console from Bethesda -- one of the biggest third-party developers in the industry. It's still too early to say how good the port will be, but what we've seen so far is a good start. Hopefully, Bethesda can stick the landing and offer Switch owners a Doom experience that looks good from every angle -- handheld mode, tabletop mode and of course, console mode.